Gardner Dozois is a well-known figure in genre circles. As well as being an award winning author, in his own right, he has edited The Years Best Science Fiction anthology series since 1984, he was also editor of Azimov’s Science Fiction magazine for twenty years. The Book of Swords (2017. 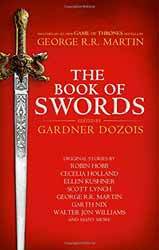 492 pages) edited by Gardner Dozois sets out to champion the sub-genre of sword and sorcery stories which have often been erroneously collected together with other fantasy genres to make a homogeneous whole. Dozios feels that this equilibrium within the fantasy genre is not always valid and points out in his informative and illuminating introduction that sword and sorcery stories have their own distinctly rich heritage. Dozois has a valid point. While many will point to Tolkien’s Lord of the Rings being a work of great importance in bringing fantasy out from the juvenile cloud, this obscures and often denies fantasies much wider, richer heritage, stretching from their origins in folk tales through to Mervyn Peake and on to the literary behemoths of Robin Hobb and George R. R. Martin. Themes are important for anthologies as they tie the various stories together. For this anthology there is the, sometimes tenuous, motif of the sword. Across the stories the level of importance ranges from tales which seem incidentally to contain swords to ones which have swords at the heart of the narrative. In all, offered up for your entertainment, are sixteen tales from a selection of well-established authors, like Hobb, who offers up a singular slice of FitzChivalry Farseer in Her Fathers Sword, likewise Martin sticks to the pre-Game of Thrones history of Westeros in The Sons of the Dragon. It’s moot to say that the stories are well written as otherwise they would not have been included in the collection. How much the motif of the sword pervades a particular story alters dramatically between the authors from K. J. Parker’s The Best Man Wins which is a lengthy contemplation about the meaninglessness of war and violence told from the perspective of a smithy making a sword to The Triumph of Virtue, by Walter John Williams, where their inclusion is mostly incidental to the tale. Ken Liu offers us a tale of an orphan turned assassin in The Hidden Girl, who finds her first mission creates a crisis of conscience. One of the stories, which I really did enjoy, due to the wit with which it is told is The Sword of Destiny by Matthew Hughes. Stories like this are one of the two reasons to read anthologies. The first is that you get more tales from your favourite authors, but more than this good anthologies should introduce you to quality authors you may not have heard of. I had not heard of Hughes prior to this anthology, but if the rest of his writing is as much fun to read I will be looking out for more of his stories. The Smoke of Gold is Glory, by Scott Lynch is a fairly straight forward quest adventure, but the anthology does visit the weirder side with stories like I am a Handsome Man, Said Apollo Crow, by Kate Elliott, whose hero is a creature made of crows and A Long, Cold Trail, by Garth Nix which offers up a hero made of papier-mâché and wood. Of the remaining authors we have stories from Daniel Abraham, C. J. Cherryl, Ellen Kushner, Rich Larson, Elizabeth Bear, Lavie Tidhar and Cecelia Holland. Taking its inspiration from such works as Robert E. Howard and Michael Morcock, the stories often present non magical world where the only thing a man or woman can rely on is the cold steel in their hands.